Kosovo has most advanced gender equality law in region — but doesn’t enforce it. In Kosovo, gender inequality and stereotypes are deeply embedded in general culture and economic relations — and little progress has been achieved in combating it. In fact, in many ways the situation has deteriorated, and in many aspects this decline has been driven by governing policies at all levels. The trend of non-inclusion of women in leadership positions and insufficient inclusion in representative positions has seen an increase in recent years, and the commitment to increasing gender equality in the political and public sphere is superficial and minimalistic. Leadership positions in institutions and politics are occupied by men, and strong political interventions are required to change this situation. When it comes to good democratic governance, equal access for men and women in decision-making is a prerequisite. In this way, a balanced participation of both sexes in political and public decision-making is one of the key factors that enables gender equality, thereby advancing the achievement of human rights and better accountability for women. It has been proven that women in decision-making positions constitute an important factor in creating better policies that directly affect the lives of women and girls in particular and society in general. And commitment to more equal representation in institutions therefore has a direct impact on reducing injustices and improving social cohesion. Looking around at its neighbors, Kosovo has the most advanced Law on Gender Equality in the region. The Law protects and promotes equality between the sexes as a basic value of the democratic development of society, and provides equal opportunities for the participation of women and men in political, economic, cultural and social life. In theory, it also obliges all legislative, executive and judicial bodies, as well as other public institutions, to ensure equal gender representation of 50 percent for each gender, which also extends to their governing and decision-making bodies. Additionally, it foresees sanctions in cases where this is not enforced. But, as with many laws in Kosovo, the situation in practice is quite different. Women’s involvement in decision-making and leadership, both within the public and private sectors, remains a serious challenge, and entrenched gender inequality prevents women from contributing to and influencing development agendas. Gender-based economic inequality in Kosovo is estimated to be the highest in Europe. Although women comprise 52.1 percent of the total number of Kosovars with a university degree, compared to 47.9 percent of men, in employment they account for only 12.7 percent compared to 46.6 percent men. 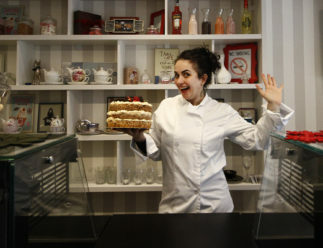 Even when they are employed, they are seldom engaged at decision-making levels. Meanwhile, legal sanctions are not enforced. Graph produced by Balkans Policy Research Group. Politics in particular continues to be considered a domain dominated by men. Gender biases, the misguided belief that men are better leaders and the lack of political support are some of the causes that prevent or actively hinder the promotion of women in decision-making positions. Likewise, unpaid work — household and family care — and the lack of day-care centers for children put women and men on a very unequal footing when it comes to devoting time to political and public engagements. In this way, women fail to engage sufficiently in political networking and fundraising activities, which limits their access to funding sources for their political campaigns. The fight against inequality and gender discrimination should happen in different fields and dimensions, and can start with the key political institutions, as the social impact of these institutions is immense and decisive. Let’s take a look at some of the key institutions and how far they have gone toward including women. In 2011, as a result of a cross-party agreement to resolve the political crisis between the most powerful men in politics, the Assembly appointed Atifete Jahjaga as the country’s first woman president, making Kosovo the first country in the region to entrust the highest state position to a woman. International representatives saw her gender, in addition to her independence, as the right solution to the crisis, caused by male counterparts who were focused on power at all costs. During her mandate, Jahjaga put many issues affecting women’s rights onto the Presidency’s agenda. For the first time, the crime of sexual violence during the war became part of the political and social debate. But her successor, Hashim Thaçi, has not shown any genuine interest in continuing the debate on the protection and empowerment of women, thereby weakening institutional commitment toward the promotion of their rights. This difference between the two presidents is clearly noticed in the selection of political advisers. Between 2013 and 2015 — the last two years of Jahjaga’s mandate — the Presidency reported that the number of women engaged in advisory positions was equal to that of men. 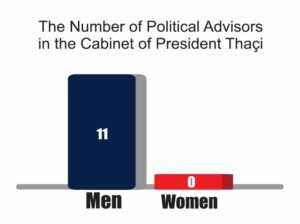 All of President Thaçi’s 11 political advisers are men. When looking at high level decision-making positions within the Presidency, regardless of who the president was, there is no big difference in the inequality of representation. Even though women were better represented in consulting roles under the leadership of President Jahjaga, since 2013, in the Office of the President, no woman has been appointed to a senior decision-making position. During 2013 and 16, out of 32 positions, 18 were held by men and 14 by women at the high management level and management level. The mandate of President Jahjaga had a positive impact on combating the gender stereotype that women lack leadership skills, yet at the same time revealed the rooted bias of women’s engagement in politics. President Jahjaga was often the subject of sexist comments and insults, including being subjected to objectification. One particular example of this was the anonymous drawing of sexist graffiti on a building wall. Such attacks on the former president prompted a strong reaction from women’s rights organisations, but there was no immediate reaction from the leaders of political parties or institutions — in practical terms silently legitimizing these sexist attacks. Since 2000, a minimum level of representation of women in the Assembly of Kosovo has been ensured through a quota, which reserves 30 percent of the seats for women — in practise, men are virtually guaranteed to occupy the other 70 percent. Although the effect of the gender quota is often contested, there are many cases in which women who were initially elected deputies through the quota, have been re-elected without being reliant on this provision. The effect was also noted in the last parliamentary elections in 2017, where women won 38 out of 120 seats in the Assembly; 17 of them won seats thanks to the quota, while 21 won their seats on their own merit, even where male candidates outnumbered the women threefold. While the representation of women in the Presidency of the Assembly is also regulated by the Assembly’s Rules of Procedure, the space for women in the chairing of parliamentary groups is very limited. In the current legislature, all parliamentary groups are led by men. This disparity shows how political parties have done nothing more than what is required by law in relation to gender representation. For example, it is rare to find a case of a political party or pre-election coalition having had more than 30 percent of women candidates in their electoral lists, the quota set by the Law on General Elections. Recent years have seen discussions about increasing the gender representation in line with the Law on Gender Equality, which requires equal participation of women at every level of decision-making or representation in Kosovo’s institutions. However, this law has never been taken into account when electoral lists have been compiled. The Law on Elections, which contradicts the Law on Gender Equality, has always been given priority. The Ombudsperson has since broached the topic, and has formally requested that political parties offer equal opportunities to women and men on electoral lists in respect to the Law on Gender Equality. Discriminatory and sexist language has been used in the Assembly by the President of the Assembly and male deputies, and these are not isolated cases. The impunity of such language is considered to have influenced the creation of an environment in which gender discrimination has become acceptable behavior. Meanwhile, the vocal participation and independent decision-making of women deputies in making laws and policies affecting gender issues continues to be a challenge. Many women deputies do not show detachment from the patriarchal approach of their male party colleagues, even when making important decisions that directly affect women’s rights and gender issues. One example of women deputies failing to vote independently from their male colleagues was in 2013 during discussions on recognising the status of the victims of sexual violence during the Kosovo war. The law did pass in 2014, but not before being opposed, especially by Democratic Party of Kosovo (PDK) women deputies, who failed to move beyond the discourse set by their male party colleagues. The Group of Women Deputies in the Assembly of Kosovo — a tool for raising the profile of women’s voices and which aims to empower women in politics and monitor implementation of the Law on Gender Equality and other laws related to the promotion of women’s position in society — has shown a greater unity of women deputies from political parties. But the messages and actions of this group fail to catalyse gender equality. The Group of Women Deputies has been constantly criticized for apparent apathy to the offensive and discriminatory approach of certain deputies. In order to increase their role in the Assembly and in politics, women deputies must firmly take initiatives that go beyond party lines. The already very small number of women in senior decision-making positions (secretary general, chief executive and executive director) within the government has drastically reduced at times over recent years. In 2015, women made up 5.6 percent of those in senior decision-making positions and in 2016 they made up 5.7 percent, while back in 2012 they made up 9.8 percent. This number has recovered since its lowest point in 2015, with 2018 seeing women in 11.9 percent of senior decision-making positions. However, in the course of seven years, the 2.1 percent increase since 2012 has been inconsequential given that two extra ministries have been created in the current mandate of the government, which theoretically should have provided more opportunity for the inclusion of women. With only one woman minister, the cabinet of Prime Minister Ramush Haradinaj marks the lowest level of gender representation of women within the state executive. Following the resignation of former Minister of Environment and Spatial Planning Albena Reshitaj — who later became an advisor to the prime minister — Minister of European Integration, Dhurata Hoxha is now the only woman minister out of 21 ministers. The formation of the government in 2017, by a broad political coalition that had to accommodate the demands of many partners, prompted all senior positions to be divided between powerful male political entities that formed the coalition. Consequently, gender representation did not feature in the power sharing discussions. The large number of deputy ministers and political advisors — positions that have been used to increase and accommodate the interests of the coalition partners — have been a regular topic of discussion in relation to Haradinaj’s government, while the tremendous increase in the number of deputy ministers and advisers has constricted any increase for women to such positions. Data published on the websites of 20 of the 21 ministries shows that out of 69 deputy minister positions (in reality their numbers are much higher, with the actual number reported to be about 80) only six have been assigned to women. The situation is similar when it comes to the involvement of women in ministry cabinets, departments and advisory bodies. It is therefore perhaps unsurprising that women are left out of all major political processes, including peace building. The technical dialogue with Serbia, facilitated by the European Union, was led by Edita Tahiri for a long time. However, her role at the helm of the dialogue did not have the same effect as Jahjaga did on gender issues. The dialogue’s rigid format has been constantly criticized in many respects, and this has led to the dialogue process providing little opportunity for integrating the gender perspective. In the current debate on the final phase of the dialogue, which aims to build peace between the two countries emerging from the war, women and their views are completely missing. Given the overarching importance and international standards for women’s involvement in such processes, reaffirmed in particular through United Nations Resolutions 1325 and 1820, the Kosovo-Serbia dialogue still completely excludes the perspective of women and young people. The Kosovo Assembly has recently appointed a negotiation team for the dialogue with Serbia, but nine of the members appointed, so far, are men. Another aspect in which implementation of the law is lacking is when it comes to the equal sharing of public resources for girls and boys, women and men. The Law on Gender Equality requires the inclusion of a gender perspective in terms of how public resources are collected and spent — a process known as gender responsive budgeting. However, the government has not yet achieved a proper implementation of this legal requirement, which should be applied on the basis of gender analysis and inclusion. In other areas, the current legal framework itself is a problem. The current legal provisions on maternity leave, under which employers are obliged to pay for six months of a mother’s leave, is highlighted as a cause of discrimination against women in employment, causing higher rates of women’s unemployment. The new draft Law on Labour is expected to be passed to the Assembly soon; the Ministry of Labour and Social Welfare and other political actors have the opportunity to finalize it with the provisions recommended by civil society that would challenge traditional gender roles in the family, society and politics, and will also have the opportunity to influence higher levels of women’s participation in employment, and political and public life in Kosovo. The inclusion of women in local government remains even more challenging. Although the gender quota is applied for municipal assemblies too, and women comprise 30 percent of the representatives in these local councils, currently no municipality is run by a woman. In the last municipal elections in 2017, there were only eight women candidates out of 204 mayoral candidates for the leadership of Kosovo’s 38 municipalities, while in 2013 there were just nine women candidates. Only two women, Mimoza Kusari-Lila from Alternativa (formerly a member of AKR) and Valdete Idrizi from PDK managed to get to the second round of elections. Kusari-Lila was already mayor of the Municipality of Gjakova when she ran for elections, while Idrizi joined PDK just before the elections; neither one was elected. Women’s representation in local election processes is minimal, not exceeding 4 percent. Often when women do run as candidates, they are not given the chance to run in powerful electoral regions or municipalities and generally run in those municipalities or regions where they are unlikely to win; meanwhile, party strongholds are usually reserved for men. For example, in the 2017 elections, PDK put forward a woman to run in Peja, while the Alliance for the Future of Kosovo (AAK) did the same in Drenas, but neither Peja for PDK nor Drenas for AAK are municipalities where these parties have a strong base. 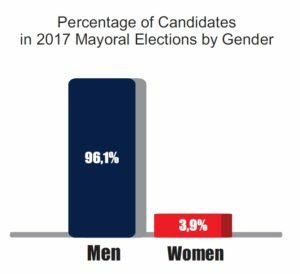 In addition to leading positions in municipalities, municipal governance also reflects deep gender inequality by leaving a very small number of leading positions to women. 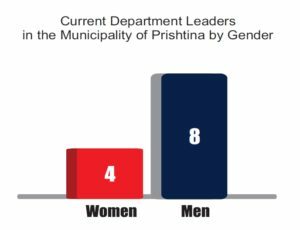 In Prishtina, women run four out of the 12 municipal departments. In the other six large municipalities, the average number of women-led departments is only two or three. Gender equality officers in the municipalities and ministries are part of the national mechanisms for improving gender equality, along with the Agency for Gender Equality. Officials face many challenges in carrying out their duties, from lack of budget to lack of political will by the government to involve them in making gender-sensitive laws and policies. The fact that most of the gender equality officers at the local and central levels are women indicates the tendency of institutions to leave women’s issues to women only, expecting men to not engage in the struggle for gender equality. It is imperative that municipalities plan and implement policies and budgetary support if they want to reduce the gender inequality gap, and they need to create genuine policies in rural areas where unemployment and discrimination are much more pronounced. Political parties have a decisive role in increasing women’s participation in politics, and consequently in promoting democratic values. Women’s involvement in politics and decision-making, and their designation to leadership positions, largely depends on political parties, and is reflected in the position of women within them. The low representation of women in political parties is proven also by the fact that, with the exception of Mimoza Kusari-Lila, who co-chairs the Alternativa party, there is no political party in Kosovo that has a woman leader. Additionally, no political party seriously addresses the issue of gender inequality in their programs. All parties that have a published programme dedicate a brief section to gender representation, but do not present any detailed proposal or plan on how to resolve this issue. This implies that this issue is far from getting equal attention compared to other topics addressed in these programs. Based on their key documents — their statute and program — political parties do not give attention to women’s involvement. This is also reflected in women’s representation in the governing bodies of parties. Most of the parties don’t apply gender representation quotas in decision-making bodies, which are generally comprised of men. Most of the political parties regulate the issue of women’s engagement through special forums for women within the party. The low representation and non-inclusion of women in the decision-making bodies of parties, combined with the lack of serious programmes for enhancing gender equality, reflect — at best — the failure of the idea of increasing women’s involvement in politics. Political parties are far from fulfilling the legal obligations deriving from the Law on Gender Equality. The Statute of the Democratic League of Kosovo (LDK) — the largest parliamentary party — does not apply gender quotas to the governing bodies of the party. Its statute defines that the head of the Women’s Forum is automatically a member of the General Council and of the Presidency. Men run all 38 local branches of LDK, and only four of the 23 members of the party’s Presidency are women. Likewise, the statues of PDK, the second largest party in the Assembly, does not apply gender representation quotas. Of the 50 members of the Presidency, only 13 are women. The situation is the same in the general council, where women hold only 38 out of 184 seats. 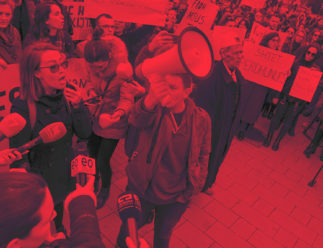 Vetëvendosje does not have a women’s forum according to the model of other parties, but the engagement of women is regulated through secretariats of women activists at each level of the organisation. The party insists against having forums and argues that men and women should be treated equally and according to their contribution. In leadership positions, Vetëvendosje has a woman as deputy leader and another as organizational secretary. Yet, it’s the opposite situation when it comes to women’s involvement at other leadership levels. Only four of the 33 party branches are run by women, and only seven women are part of its 23-member Presidency. The Social Democratic Initiative (NISMA), like most other parties, doesn’t regulate the issue of equal gender participation with gender quotas but only through the special organization of women (Women’s Initiative for Kosovo). But there is no information on their official website about the actual representation of women in its governing bodies. The same goes for the New Kosovo Alliance (AKR), which party does not apply gender quotas and addresses the issue of women’s involvement through the AKR Women’s Forum. The only political parties in Kosovo that have included gender quotas in their statutes are the AAK and the Social Democratic Party (PSD). The latter, since its foundation in 1990, has had defined in its statute that all governing bodies, including the Steering Council and the Presidency, must have a minimum representation of 40 percent of each gender. However, this political party, now led by Mayor of Prishtina Shpend Ahmeti, was almost non-functional until the 12 deputies that left Vetëvendosje in 2018 took over its leadership and rebranded the party. Since the party is still in the process of re-formatting and with no political platform to date, the issue of gender equality remains undefined. 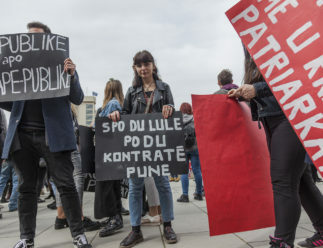 Meanwhile, amended in 2018, the new statute of Prime Minister Haradinaj’s AAK defines that 30 percent of those in elected party bodies should be women. However, in the 60-member AAK Presidency, only 12 are women — which is less than 30 percent. Additionally, women chair none of its 35 local branches. Youth forums within the political parties, as structures to facilitate the involvement of young people, also fail to create a good foundation for potential future women leaders. Gender representation in youth forums reaches somewhere between 30 and 40 percent, however, even youth forums have not completely eliminated discriminatory practices. In recent years there has been a growing rhetoric around the promise to increase gender equality. The 2017 parliamentary elections saw discussions on gender equality as never before. However, most political platforms and the election programs of political parties have no concrete policy proposals for advancing the position of women or for enhancing gender equality. Parental leave and financial support for mothers during maternity leave was the most discussed issue by each political party when it came to gender equality. But, with the exception of Vetëvendosje, all political parties failed to make concrete proposals for parental leave that would reduce discrimination in the labor market; in addition, parental leave discussions led mainly by men have only strengthened traditional gender roles. However, the new draft Law on Labour provides the political parties with a concrete opportunity to address this issue in favor of gender equality. Because of the early and unexpected election in 2017, political parties had to compile candidate lists at the last minute. Apart from the former women deputies or women who had previously had an important political post, other women candidates had no opportunity to establish a public profile. Even in cases in which women politicians have a consolidated electorate base, they have faced significant obstacles from inside their male-dominated parties; Vjosa Osmani is one of the most voted deputies in the Assembly and in 2017 she was the only woman among the 10 most voted for deputies, but LDK’s leadership ranked her number 81 on its coalition’s candidate list for elections. Furthermore, analysis of TV broadcasts has shown that political parties have given significantly less media exposure to their women candidates. In most televised political debates, the parties were represented mainly by men. 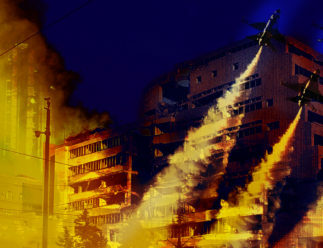 This article is adapted from an analysis written by Balkans Policy Research Group, and has been published here with permission. The original report can be read here.